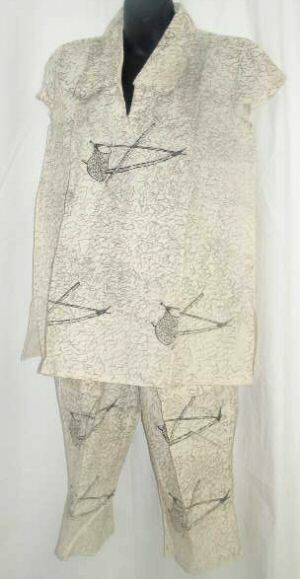 Minstrel is a 100% hand screen printed shorts (capri) set. It is dressy enough for the office with the collar shirt and cap sleeves. The top measures 15″ from shoulder to shoulder and 20″ across the chest. It is 27″ from shoulder to hem. The capri bottoms have and elastic waist with two side pockets. The waist measures 22″ relaxed and 40″ fully extended. They are 28″ from waist to hem with a 16″ inseam.